The towering sign of a long-legged cowboy that Bob erected next to the building became a major landmark on Route 66. From the beginning, the Big Texan welcomed weary travelers and migrating families whose roots spread all across America. The now World-famous FREE 72-oz. 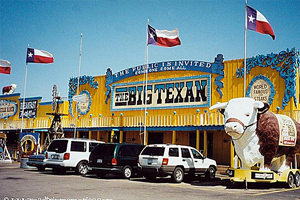 steak came to life not long after Bob opened the doors to the Big Texan Steak Ranch. Taste of the Old West! 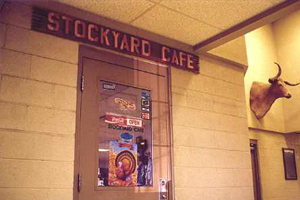 Fun Fact: This cafe is in the big sale barn at the Amarillo stockyards where they auction off thousands of cattle a week. Menu Highlight: Truckers and meat men stop by for the honest hash-house breakfasts: steak and eggs, breakfast burritos, salsa-garnished huevos rancheros and stacks of flapjacks. Located in the big sale barn at the heart of the vast Amarillo stockyards, where several thousand head of beef cattle are auctioned every week, this is one sure-as-shootin’ cowpunchers’ haven with a mostly-steak menu plus honest hash-house breakfast every morning starting at 6. Fun Fact: The cafe is the mid-point of Route 66. It is exactly 1139 miles to Chicago and 1139 miles to Los Angeles. Menu Highlight: Ugly Crust Pies are the creation of Joann H. She used her grandmother’s recipe for crust, which tastes delicious but looks lumpy and ugly. Located at the traditionally accepted halfway point of Historic Route 66, the midpoint between Chicago and Santa Monica. Accross the street from the cafe is the “Welcome To The Midpoint” sign, one of the top photographed signs along Route 66. We are also the ONLY place on Route 66 to get Midpoint RT66 Gifts and Souvenirs, so please stop in and see the gift shop inside the cafe. Have been told by many visitors that the MidPoint Cafe and Gift Shop is one of the best gift shops along all of Route 66. So see for yourself!!! The exterior of the Boot Hill Saloon & Grill, at the intersection of U.S. 385 and old Route 66 in Vega, Texas, looks like something from the 1880s Old West. 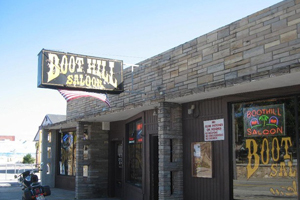 Bottom line, Boot Hill is an ideal place for a special occasion or a romantic evening — the sort of restaurant that Vega residents have been wanting for years. And the food is creative enough that this out-of-towner will return. 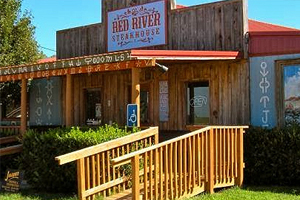 The Red River Steakhouse opened in 1997 and quickly became a place right out of a legend. Believe in community and strive to build the communities in which we are located. It is the belief that can make a difference even if its just offering a great place to hang your hat after a hard days work. We feel that if we help take care of the community the people of that community will take care of us. 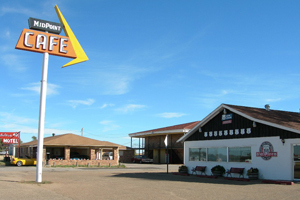 The Red River Steakhouse is situated on the famous Route 66 highway immortalized by the popular song of the same name in McLean, Texas. Located in the Panhandle of Texas, the Red River Steakhouse has been a welcome site to tens of thousands of hungry travellers motoring down this historic highway outside of Amarillo, Texas.